My name is Bernardo Aguila and my wife Blanca along with ours kids, Eddie, Michelle, Jennifer and Alina are part of the Adlerhaus. We live in “The Little Pueblo of Tucson” Tucson is 100 miles south of Phoenix and 60 miles north of Nogales Arizona/ Mexico. We are a show working home, but most importantly, WE ARE CODE OF ETHIC ROTTWEILER BREEDERS. We love the time we spend with our rottweilers in our home. We strive to breed only healthy Rottweilers which have passed the following health certifications, OFA Hips, Elbow’s, eyes and heart. We have been involved with Rottweilers since 1995. In that time we have been attending different shows, to learn from reputable rottweiler breeders and professional handlers. In 2002, we decided to start showing in AKC rings, also we have been attending German style shows in the west coast area. My interest in Rottweilers has been for my true love for this wonderful breed. Our mission is to strive to bring the best of both worlds, together when it comes to the Rottweiler. I see the correct rottweiler close to the correct Standard as possible. The Rottweiler should posses strong breed type and sound structure. The temperament should be strong yet protective and gentle with family and children. Our breeding program consists of imported bloodlines along with American that have proven themselves over the years to be the best in the ring. 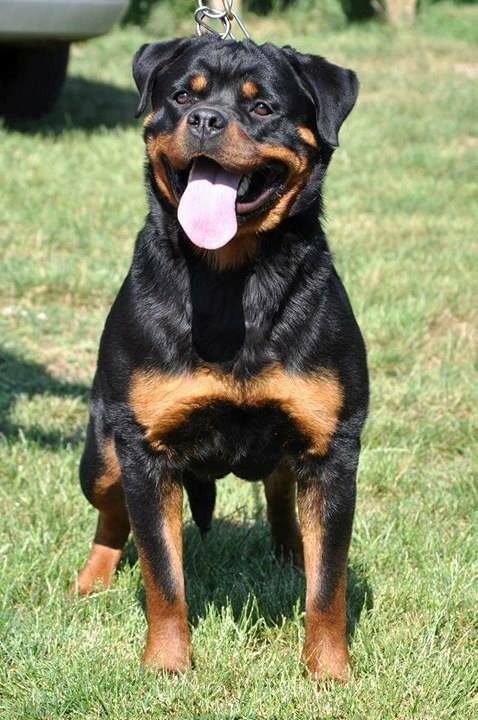 We are using bloodlines from Germany and other parts of Europe and the U.S.
Our goal is to keep in mind that the Rottweiler is a working dog and complimented with beauty of conformation, temperament and working ability. Thank you for your time and enjoy your visit.